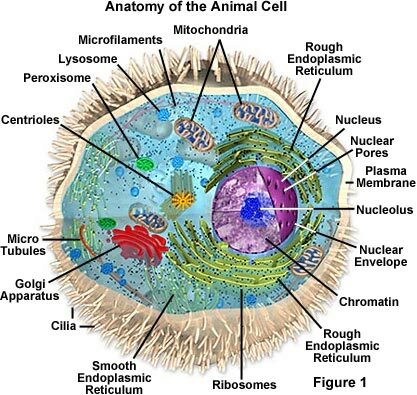 An animal cell typically contains several types of membrane-bound organs, or organelles. The nucleus directs activities of the cell and carries genetic information from generation to generation. The mitochondria generate energy for the cell. Proteins are manufactured by ribosomes, which are bound to the rough endoplasmic reticulum or float free in the cytoplasm. The Golgi apparatus modifies, packages, and distributes proteins while lysosomes store enzymes for digesting food. The entire cell is wrapped in a lipid membrane that selectively permits materials to pass in and out of the cytoplasm. Animal cells are typical of the eukaryotic cell, enclosed by a plasma membrane and containing a membrane-bound nucleus and organelles. Unlike the cells of the two other eukaryotic kingdoms, plants and fungi, animal cells don't have a cell wall. This feature was lost in the distant past by the single-celled organisms that gave rise to the kingdom Animalia. The animal kingdom is unique amongst eukaryotic organisms because animal tissues are bound together by a triple helix of protein, called collagen. Plant and fungal cells are bound together in tissues or aggregations by other molecules, such as pectin. The fact that no other organisms utilize collagen in this manner is one of the indications that all animals arose from a common unicellular ancestor. Animals are a large and incredibly diverse group of organisms. Making up about three-quarters of the species on Earth, they run the gamut from sponges and jellyfish to ants, whales, elephants, and -- of course -- human beings. Being mobile has given animals the flexibility to adopt many different modes of feeding, defense, and reproduction. The earliest fossil evidence of animals dates from the Vendian Period (650 to 544 million years ago), with coelenterate-type creatures that left traces of their soft bodies in shallow-water sediments. The first mass extinction ended that period, but during the Cambrian Period which followed, an explosion of new forms began the evolutionary radiation that produced most of the major groups, or phyla, known today. Vertebrates (animals with backbones) are not known to have occurred until the Ordovician Period (505 to 438 million years ago). Endoplasmic Reticulum - The endoplasmic reticulum is a network of sacs that manufactures, processes, and transports chemical compounds for use inside and outside of the cell. It is connected to the double-layered nuclear envelope, providing a connection between the nucleus and the cytoplasm. Microtubules - These straight, hollow cylinders, composed of tubulin protein, are found throughout the cytoplasm of all eukaryotic cells and perform a number of functions. Nucleus - The nucleus is a highly specialized organelle that serves as the information and administrative center of the cell. Send mail to istartweb@hotmail.com with questions or comments about this web site.